Rubber Stair Nosing that brings a professional finish to any hard surface such as tile, wood, or stone. Also provides stairs protection from slips and falls. Perfect for commercial or residential indoor applications where nonslip protection is important. 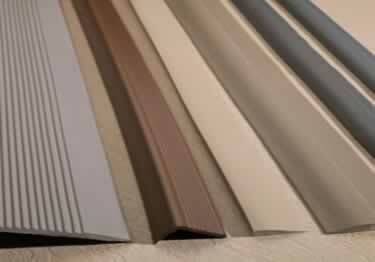 The rubber stair nosing comes in 6 designs and 30 colors. Residential or commercial indoor applications where stone, tile, or wood steps require a professional safety stair nosing finish. We recommended Epoxy Flooring Adhesive #A402. Contains 10% natural rubber, a renewable resource which may contribute to the LEED Green Building Certification System, and meets CHPS criteria. Ribbed designed for added traction and non-slip grip. I am looking for something similar to your rubber stair nosing for outdoor (Sheltered) use. Hi, I have a condo with 16 stairs leading to the main living area. I removed the carpet and painted the steps, but the nosing needs reinforcement for durability. I'm thinking of the design A606 #6 because I just want to cover the nosing part, not the main step part. Will this work? The material is particle board and the existing stair nosing is rounded and about 1.25" high. What would you recommend? Do you sell rubber stair nosing longer than 9'? I need one that is 12' in length. Also, do you ship to Canada? Thanks! We are installing the Allure floating planks from Home Depot on the stairs of a rental home and need a stair nosing. The stair ends are rounded. What would work the best for this job? I would like to use stair nosing # M-7 with a combination of 1/4" plywood underlayment and 3/16" tile on the treads. Would the underlayment flush out with the first profile height? I'm a little confused about this product coming in 9ft instead of amount of stairs. How do I know the quantity I would need for my staircase? Also, there is a landing that I would like to put a matching cover on. Is that product something you sell as well? I want to use rubber nosing on my stairs. I will put down porcelain tile on the horizontal surfaces and wood on the vertical surfaces. Both the tile and the wood are 1/4 inch. Which profile should I use? My front porch has a wood deck and the planks run parallel with traffic with a small 3" plank at the front step. Over time the 3" plank has shown wear and I would like to cover with one of your rubber 4" wide treads. All your comments are for indoor and I want to know if it will be ok for exterior. We live in Charleston , SC so we very seldom see below freezing temps. Also will salt air affect the rubber? Look forward to hearing from y'all. Hi, i have ordered the rubber square landing tiles for a landing which has seven steps below to basement, also order rubber stair treads for the steps. Do i need a stair nosing on the landing that leads to steps? Or just the landing tile? Thnx. I am looking for stair nosing that can go around a circular opening so it needs to be flexible. Is this product something I could use? In regards to the rubber stair nosing #A606 profile # 5, can I get this custom size to 54"? Is rubber nosing OK for outdoor use on wooden stairs? I would screw the nosing into the steps. Which rubber or vinyl nosing do you recommend for carpeted stairs to prevent slipping? This is for well-used stairs. Thanks. I have some Roppe rubber stair nosing and I need to purchase some more. My size is 1 3/4 x 12 x 4' I have a sample and I would like you to match the color and give me the part # and price. Do you have a name and address I can send the sample? So satisfied with this product. It's exactly what I needed in my motorhome. I looked everywhere and finally found it on this website. It's perfect. Thank you for your review. We appreciate your feedback and are very happy our product was able to fulfill a solution for your motorhome stairs. worked perfectly for the purpose. received my order, cut them to my length requirement and had it installed myself. Thank you for your review. We very much appreciate your feedback and glad to know the Roppe Stair Nosing worked perfectly. Used it before and will continue to Use! As always, the product is excellent customer service even better. I have referred quite a few new customers to Koffler Sales. Thank you for your review. We also appreciate your kind words about our Stair Nosing and customer service. Thank you for your review. We very much appreciate your feedback and we're glad our Roppe Rubber Nosing was helpful in finishing off your project. The quality of the product and the price point was perfect! Customer Service helped me select the perfect color. Love this product! Buy it! Exactly what i needed, works great, easy to work with, great price! The only thing I could think of for nosing on stair steps that are rounded (quarter circle) on one side. The radius of these is still too big, but with a series of V cuts I was able to get a much tighter radius. Short of rebuilding those steps, this was the only way to do the job! Very pleased with the customer service-- Joanne sent out a number of color samples so I could get a close match to what I needed. Great service, nice to be able to call and talk to someone about an order placed online! We installed rubber nosing on a long step between two rooms. The nosing is strong and uniform, and makes a nice clean edge. The rubber is better than metal or wood for a house full of kids who are constantly bumping into the stair. Very functional and professional.